This book is delightful in knowledge and consistently intense. as an introduction to his work. I have added links to follow. In 1969 a book was published which figured to revolutionize the study of human history. This was Hamlet's Mill: An Essay on Myth and the Frame of Time, written by two historians of science, Giorgio de Santillana of MIT and Hertha von Dechend of Wolfgang Goethe University in Frankfurt. The startling hypothesis of this book was that myth, on one level, constitutes nothing less than a technical language created to encrypt and pass on very sophisticated astronomical observations related to the precession of the equinoxes. The precession is a gyroscopic-like wobble of the earth's axis of rotation requiring 26,000 years to complete a single cycle. Two aspects of this work - which the authors themselves styled a "first reconnaissance" into the subject - were pure dynamite. First, if the ideas in the book were true, then those myths which are astronomically encrypted are self-dating, that is they carry a record of a moment in precessional time that is at least as accurate as a radio carbon date. This view renders obsolete the concept of "prehistory" which is defined as "before the written record." Second the authors found that a very precise and idiosyncratically expressed religious cosmology, linking world ages to the gain or loss (due to precessional motion) of "access" to the Milky Way at solstices and equinoxes is found in cultures all over the world. The clear implication of these ideas was that an unexplored, and highly dramatic history of the human race awaits engagement by students of the human legacy. I was so bowled over by these ideas when I first encountered them - in 1974 - that I eventually realized I had to know if they were true. The very first thing I learned was that there is no university in world where you can go to learn anything whatsoever about these ideas. The academy, for reasons of its own, has chosen to ignore the profound implications of this work for going on 25 years now. My own book, The Secret of the Incas: Myth, Astronomy and the War Against Time (Crown 1996), is an account of my own twenty year journey of exploration into the astronomy of myth, and I am happy to report that this odyssey was not undertaken in vain. I am now certain that Hamlet's Mill will, sooner or later, revolutionize our understanding of our past and even who we are as human beings. I have taken rather a long time in setting up a brief discussion of my book because I want to make clear that what I found out about the Incas came as a complete surprise. I didn't set out in search of esoteric prophecies or experiments in geomancy on the scale of empire. I had initially chosen the Incas to study because they had no writing and hence relied largely on oral tradition - myth - for the transmission of information across time. Furthermore, it seemed to me that if the cosmology described in Hamlet's Mill really was operative in the southern Andes, then truly we must be looking at a world-wide phenomenon. From the beginning of my research, however, I was constantly made aware of the strangeness of the events surrounding the formation and destruction of the Inca Empire. Few people realize that this empire was less than a century old when it was utterly destroyed by a handful of Spanish conquistadors. In 1532 a Spanish expeditionary force of 175 hardened adventurers, under the command of Francisco Pizarro, ascended the Andean massif in search of a fabled Empire of Gold. Unknown to them as they approached two great Inca armies were engaged in the climactic battle of a great civil war of succession. When, on November 15, the Spanish force reached the ridgeline overlooking the valley of Cajamarca the victorious Inca king Atahuallpa was completing the third day of a fast of thanksgiving for his victory. What the Spanish saw was an encamped army of 40,000 men. That night the Spanish made out their wills and said confession. Yet on the morrow, given the advantage of surprise and horses, they would engage this army, capture the Inca and kill or wound 10,000 men. Only years later would I realize that the legends that the Inca Empire was born under the shadow of a prophecy were all true. About the year 1432 the father of the first Inca Emperor foretold that after five generations of Kings the Empire and its religion would be utterly destroyed. The fifth and last king to rule the Empire unmolested was Huayna Capac, father of Atahuallpa. In my research I first found that Inca myths did indeed encrypt precessional information. The first stories which I came to understand concerned a "flood" which destroyed the entire "world" but which was survived by a peasant along with his family and flocks who ascended the "highest mountain in the world" to weather the storm. Applying the "tool kit" of Hamlet's Mill, I regarded mythical animals as representing the constellations named after them; topographic references as analogues for positions of the sun on the celestial sphere; and mythical "gods" as planets. As a result I learned that these flood myths yielded a date of 650 A.D., which corresponds precisely to the latest archaeological findings in the Andes that a repressive, secular and militaristic empire, known as Wari, suddenly conquered the greater portion of the Andean Highlands beginning in the early 7th Century. The astronomical, or precessional event which took place at this time was the failure (for the first time in 800 years) of the Milky Way to be visible at sunrise on June solstice. In cosmological terms, this meant that the gates of the land of the gods had slammed shut. Years later I would find the myth - the foundation document of the Inca Empire, really - that formed the theoretical basis for the Inca prophecy. 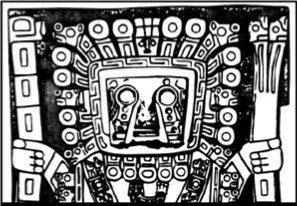 In 1432 the Inca priest astronomers could see that a predictable precessional event loomed in the future, only this time it was the gates to the land of the dead which were about to slam shut. It was this predictable event which gave rise to prophecy. Since the foundations of Andean religion rested upon ritual interchange with the ancestors at December solstice, the closing of the "gate," if taken literally, would indeed bode the end of everything. Finally, I learned that the Inca Empire was conceived and formed for the sole purpose of stopping this event from happening. The Inca Empire was an experiment in sympathetic magic, designed to stop time in the sense of precessional motion. The primary means for achieving this end were the ritual uses of warfare and of human sacrifice. Since each tribe in the Empire had from the most ancient times considered itself descended from a particular star or constellation, the Incas offered a yearly sacrifice of a child from every tribe in order to send emissaries back to the stars with a single message: "May the earth not turn over, may the sun and moon stay young, may there be peace." a plea to the creator to keep open the bridgehead to tradition that spanned the Milky Way. The creator's response was a terrible one, for he sent the Spanish, who arrived precisely on time. The Incas were never able to regain the edge which they gave up initially on that first day in Cajamarca, and so the prophecy came true. Now, this is a strange story, a story so powerful in fact that it threatens to swamp what I think is the real significance of the research I have done. The Incas were a test case. By applying the tools of Hamlet's Mill to a single culture, and in depth, the history of a so-called "prehistoric" people has been rewritten. Along the way I found that the Incas shared with peoples all over the world access to a peculiar meta-language - the technical language of myth - which is so distinctive and so idiosyncratic that no mechanism other than seaborne contact appears adequate to explain its wide diffusion. The implications of this finding are staggering. It means that we are all heirs a world-wide civilization of great time-depth of which we have virtually no notion. The histories of the individual peoples who participated in this great tradition lie gathering dust on dark library shelves, classified as "myths." Meanwhile the academy continues to turn its back on this, the heritage of the human race, a system of thought which gave rise simultaneously to the human scientific tradition and to human religion as well. Indeed all the world's great religions, including Judaism, Islam, Christianity, Buddhism, Shinto, Hinduism, Shamanism and Native American Great Spirit religion, make frequent, respectful reference to this ancient system of thought. From Newgrange in Ireland (ca. 3200 B.C.) to Angkor Wat, from Tiahuanaco to Babylon, from Giza to Hawaii, we live in the ruins of a civilization whose very existence we only dimly suspect. As the precessional clock ticks onward - a clock whose rhythms the ancients were convinced gave clues to the rhythms of human history - perhaps it is past time that we humans reclaim our history, which is our birthright, and with it perhaps reclaim some of the more sacred aspects of our human nature. William Sullivan is a native New Englander. Educated at Harvard College, he was a Peace Corps Volunteer in Rajasthan India, and later studied the History of Religion under J.G Bennett at Sherborne House in Gloucestershire, England. In 1988, after several years of fieldwork in Peru and Bolivia, he received a doctorate in American Indian Studies from the University of St. Andrews, Scotland. He lives in central Massachusetts with his wife Penelope and their children Phoebe and Jonathan. There are bears in the backyard.